"The real beauty of Twitter...is that you are taken to places you didn’t know you even needed to explore." ~ From my 2009 article on Twitter as a PLC - still rings true to me in 2013! Let's get started: Click here for directions on setting up your Twitter account. William M. Ferriter's article in ASCD, Digitally Speaking / Why Teachers Should Try Twitter --> Conversational tone will help newbies feel comfortable getting started. 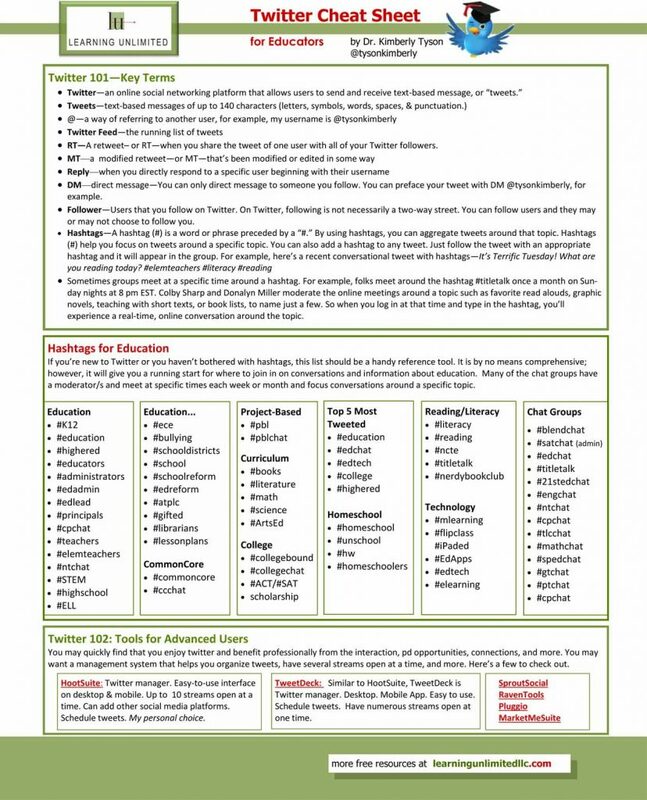 Twitter Cheat Sheet from Indiana's Kimberly Tyson --> Organized chart helps us get right to it! Find Your Thing on TeachThought --> I love this site and just want to take you there. After reading this short but motivating article, click on the TeachThought banner to go to the homepage and prepare to be blown away. Comprehensive Twitter data from the Pew Research Center. Shameless self-promotion: I believe my 2009 article called Twitter as a Professional Learning Community is relevant today. And so does Dan! Heard on NPR: On Its 7th Birthday, Is Twitter Still The 'Free Speech Party' 7.